With a charging rate of up to 150 kW, the Audi e-tron is currently the fastest electric vehicle at the charging station. nextmove has driven an Audi e-tron down to 0% in order to charge it to 100% at an IONITY charging station to test the charging speed. The video is available with English subtitles. Audi has equipped the e-tron with a 95 kWh battery. However, only 84 kWh of this can be used, so that there is a sufficiently large buffer in the lower range at 0% and also in the upper range at 100%. This buffer has two big advantages. Firstly, it prevents the battery from being driven to the limits, which would cause the battery to age faster. On the other hand, it enables a high charging performance over the entire charging process. 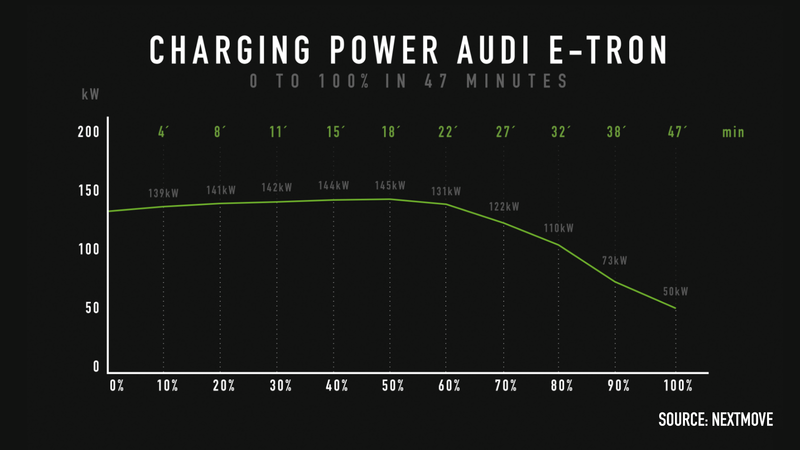 At 0% state of charge, the Audi etron enters the charging process directly with 132 kW. The high charging power of 400 volts and 350 amps right at the start enables the battery level to rise rapidly to 10% within the first 4 minutes. The charging power continues to increase continuously up to the peak value of 145 kW. The Audi e-tron charges half full in just 18 minutes, which is truly an outstanding performance. Compared to all other electric cars, the charging power of the e-tron does not drop immediately after reaching the peak value. Even in the second half of the charging process, the power drops relatively slowly. At 90% battery power, the e-tron still charges with 73 kW. All in all, the e-tron has been charged to 100% in just 47 minutes, giving it a clear edge over the competition. A high charging capacity is important on long distance travels. But much more important at present is a nationwide charging network and, of course, the technical availability of the charging infrastructure. In Germany and Europe there is currently no nationwide CCS high-power charger network available. IONITY has set itself the goal of establishing a Europe-wide network of fast chargers by 2020. In our test it was not possible for us to start the charging station in Hohenwarsleben ourselves with different billing systems. A call to the service hotline was necessary to start the charging process. Unfortunately, this is not an isolated case, but a phenomenon that has to be factored into the route planning. In our experience, only 70 to 80 % of charging stations are currently available. Not in all cases the service hotline is able to start the charging station. At Tesla you can rely on the supercharger network. Superchargers can therefore be approached with a remaining range of 0 to 10%. Outside the Tesla network, you should always drive with a safety reserve. Otherwise you run the risk of stranding at a non-functioning charging station. Trying out different authentication options, switching between charging stations and making phone calls with the hotline can quickly consume valuable 15 minutes. Audi e-tron at 200 kph on Autobahn! How long does the car last? Dieser Eintrag wurde veröffentlicht in Audi etron, Video. Lesezeichen auf den Permanentlink.